Rob is a Lean, Agile and DevOps Consultant at Ammeon where he advises companies how to accelerate the delivery of software-enabled products and services. A career encompassing Development, Engineering, Testing and Product Management roles has provided Rob keen insight into the real-world challenges facing organizations today. 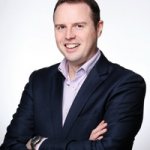 Rob is an active leader in the Irish Agile community and holds an MBA from London School of Business and Finance. In 2015 a software development team called Chaos was going through a state of transition. The team had got several new members, a new Product Owner and the Scrum Master had just left. The remaining members did not know if the team would survive for six months. This talk will show how we used metrics as a backbone to establish a new culture withing the team to become recognised as a high-performing team and to thrive, and to win a major project and deliver it.